I hadn’t seen much talk on doing data comparisons on temporal tables, as they are a new feature. I went through the exercise to compare current to historical to see how Red Gate & Devart handled this. I’m a part of the Friends of Red Gate program, so love checking out their latest updates, and I’m also a regular tester on Devart which also provides fantastic tools. Both handled Temporal Tables with aplomb, so here’s a quick walk through on how I did this. 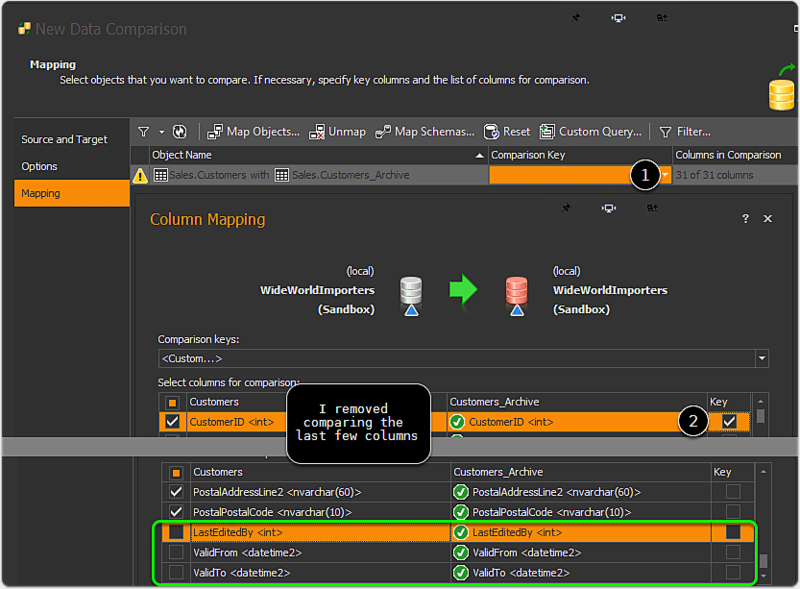 With the latest version of SSMS, you can see the temporal tables labeled and expanded underneath the source table. 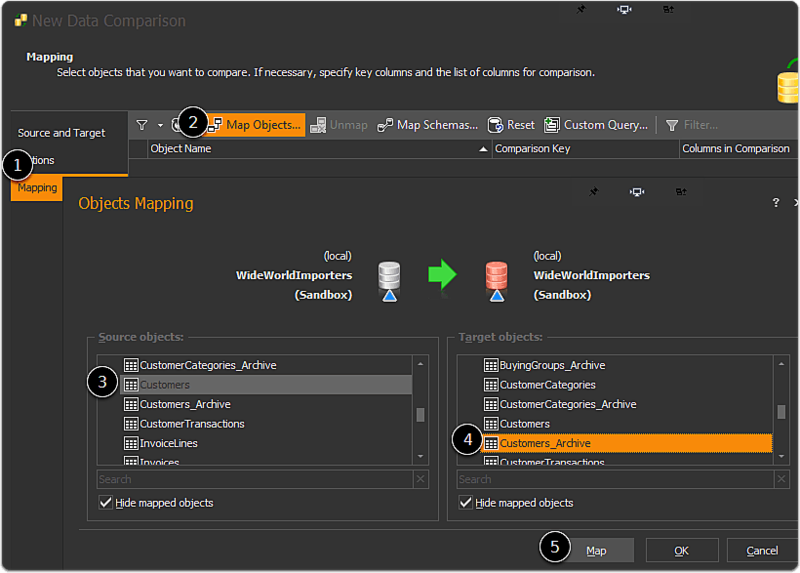 To remap the Customers to Customers_Archive, we need to select this in the tables and choose to unmap the Customer and the Customer-Archive Tables from each other. This is 2 unmapping operations. 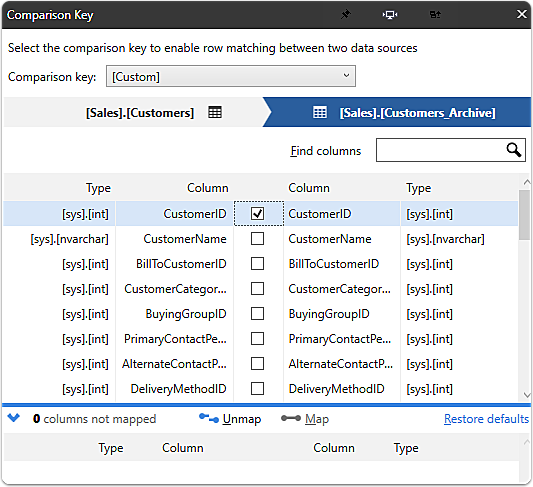 Go into the comparison settings on the table now and designate the key as the value to compare against. For the purpose of this example, I’m just doing key, you can change this however you see fit for your comparison scenario. In this example, I’m removing the datetime2 columns being used, to instead focus on the other columns. If you run into no results coming back, look to turn off the setting in compare options for Checksum comparison, which helps improve the initial compare performance. With this on, I had no results coming back, but once I turned off, the comparison results came back correctly. The entry identified as potential conflict by DbForge is identified in the Only In Destination. Both tools report differences. RG’s tool has focused on the diff report being simple CSV output. This is fine in the majority of cases, though I’m hoping for additional XLSX and HTML diff reports similar to DbForge eventually. 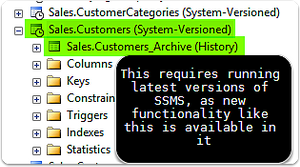 In the case of the CSV output, you could consume the information easily in Power-BI, Excel, or even… SQL Server :-) No screenshot on this as it’s just a csv output. 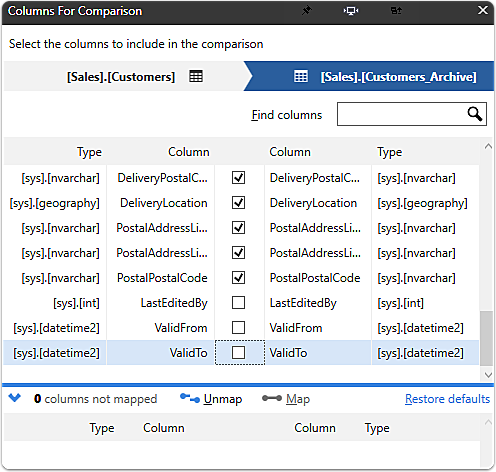 Going into the mapping, you can see support for Customers and Customers_Archive, which is the temporal history table for this. In this case, I mapped the current table against the temporal table to compare the current against the change history. As a simple example, I just provided the primary key. You could get creative with this though if you wanted to compare specific sets of changes. 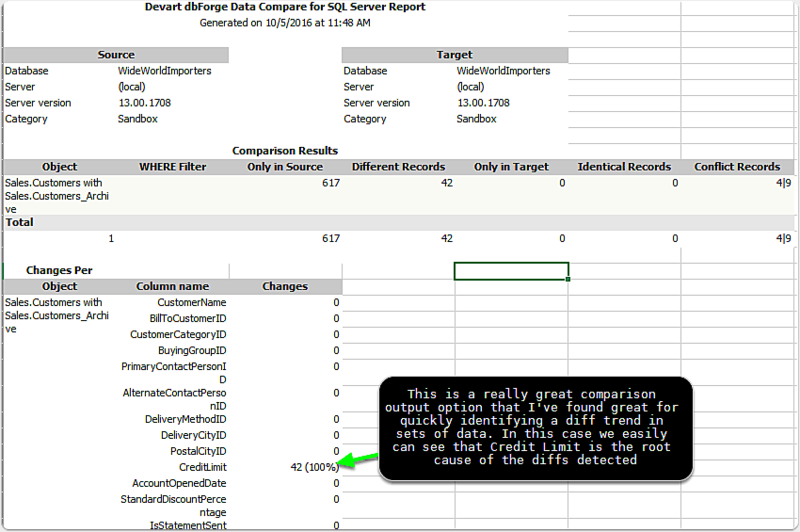 The diff reports provided by DbForge Data Compare are very well designed, and have some fantastic output options for allowing review/audit of the rows. Here is a sample of a detail provided on the diff report. One feature I found incredibly helpful was the bold highlighting on the columns that had diffs detected. You can trim down the report output to only include the diff columns if you wish to further trim the information in the report. Overall, good experience with both, and they both support a lot of flexibility with more specialized comparisons.